Century Drive collection is our black four-piece set room, made of wood frame and webbed seat, re-construction. Furniture has a lot of fiber back cushions and standard density foam seat. 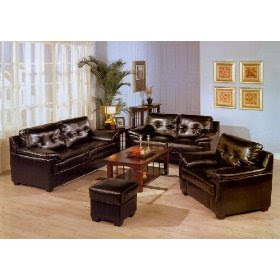 Furniture is covered with black leather like vinyl. Set consists of sofa, loveseat, chair and ottoman. Sofa size is 95 x 36 x 37 x, 48 x 36 seats x 37 x, loveseat 70 x 36 x 37, ottoman 20 x 20 x 18.